Breast cancer is common in the UK, affecting affect around 1 in 10 women at sometime during their life. However, it can now be treated very effectively, with a permanent cure for most women who develop breast cancer. Diagnostic imaging pays an important role in breast cancer screening and post treatment surveillance. It is also an integral part of the assessment of breast symptoms caused by benign conditions. Mammography uses x-rays to take an image of the breast. It is used in screening for breast cancer and to investigate breast symptoms. Conventional mammography produces the image on X-ray films. The newer technique of digital mammography results in digital images, which are viewed in greater detail on computer workstations. Digital mammography is acknowledged to be more sensitive (for breast cancer?) than standard film mammography for younger women and is available at the Royal United Hospital, Bath, the BMI Bath Clinic and CircleBath hospitals. Breast Ultrasound uses high frequency sound waves to obtain real-time images of the breast tissues. It is a more suitable technique than mammography for younger women (under 35years) who have more glandular breast tissue. 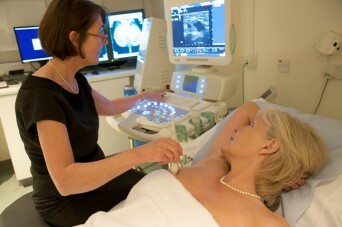 However, ultrasound is often used in addition to mammography to investigate breast problems further. Breast MRI is a specialised imaging technique, which is helpful in certain types of breast cancer (particularly for lobular breast cancer), and for assessing problems in women who have breast implants. Breast MRI is used in screening women with a very high risk, such as those with a family history of breast cancer or women who were treated for Hodgkins disease at a young age. The NHS Breast Screening Programme offers breast screening with mammography for women from the age of 50years. The screening mammograms are performed at 3 yearly intervals. Some women opt to have additional private mammograms in-between the NHS screens, with a breast screen every 18months. Some women may wish to commence screening from the age of 40yrs with annual mammograms until aged 50yrs. Earlier screening with mammography is advised for women from the age of 40yrs who have a significant family history of breast cancer. Some women with a very high risk, such as those with a family history of breast cancer or who have had chest irradiation for the treatment of Hodgkins disease at a young age, are advised to have screening with breast MRI. The diagnosis of breast cancer requires a biopsy for pathology. This is best performed under image guidance, either using breast ultrasound or mammography to guide the needle. Certain very small cancers need to be localized for the surgeon before surgery. This is done under image guidance on the day of surgery.